Please let me know what you think, and message me if you have any suggestions for future articles you would like to see. 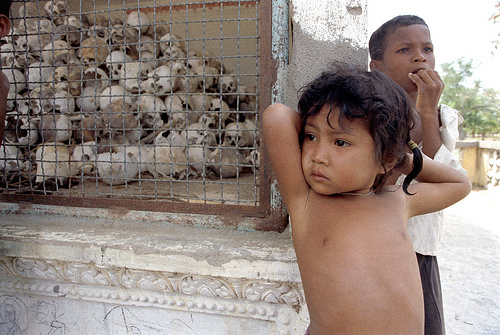 By examining the actions of Pol Pot and the Khmer Rouge, the perpetrators of the Cambodian Genocide, we can recognize a number of core features of psychologically disordered regimes. This post describes the nightmarish world psychopaths create when their psychology becomes manifest in the societies they control. This post outlines three key convictions that academic and political activist Noam Chomsky has held for decades and invites you to comment on these controversial but crucial issues. Do you agree with Chomsky that this really is how the world works? Narcissistic bosses damage the mental health of their employees, undermine the effectiveness of their organisations, and, collectively, threaten the well-being of society. Today, more than ever, sane leadership is needed to overcome the daunting challenges we face. This post argues that we can no longer afford to allow mentally disordered individuals to run our most important organisations. Mao Zedong suffered from multiple personality disorder, exhibiting psychopathy, narcissistic personality disorder and paranoid personality disorder. His terrifying vision for China was a direct reflection of this potent mix of psychopathology. This post provides an insight into Mao’s disordered personality and the devastating impact that his 27 year reign of terror had on China. After watching the evening news, it’s hard to make the argument that religion makes us kinder to one another. Amidst the contemporary whirlwind of sectarian hatred, it is time to finally recognise that morality is possible without god. This post argues that a rejection of religious dogma is needed if we are to expand our capacities for love and understanding. For one hundred years the concept of narcissism has been the focus of successive generations of psychoanalysts. Yet in the public mind, misperceptions persist. This post describes how the narcissist’s overbearing self-importance masks a precarious state of mental fragility. And why people with narcissistic personality disorder are more likely to be pursuing their grandiose dreams – at enormous expense to society – than coming to terms with their lack of substance within. During the 1960s three of the most narcissistic Presidents in US history came to power – John F. Kennedy, Lyndon Johnson and Richard Nixon. During this period the U.S. became embroiled in a series of catastrophes including the Cuban missile crisis, the Vietnam War, and the bombing and invasion of Cambodia. This post describes how, in a world full of psychopaths, the US increasingly began to act like them. Stalin, like Mao, suffered from multiple personality disorders including psychopathy and narcissism. While Stalin seldom attended executions or torture in person, he liked to hear in detail about the suffering of his victims and would shriek with laughter on hearing of their last desperate pleas for mercy. This post describes his reign of terror and how the ghost of Stalin haunts Russia still. When psychopaths and people with other dangerous personality disorders hold power, the result is political tyranny. The Arab Spring however has shown that the overthrow of political tyranny leaves a second form of tyranny largely intact – the tyranny of traditional culture. This post shows how the absence of adequate protections for human rights leaves women, gay people and other minorities vulnerable to the tyranny of their fellow citizens. The rise of Islamic State (IS) and its seizure of large parts of Iraq and Syria have caused alarm in the West and across the Middle East. Alarming as it is, however, Islamic State has not risen in a vacuum. Instead IS should be seen as an outcome of thirty five years of continual warfare across the Middle East. This post looks at those thirty five years of conflict and the seven steps that have led to the emergence of ISIS. This entry was posted in Why We Need to Defend Democracy and tagged Adolf Hitler, Al Qaeda, Cambodia, Chomsky, Holocaust, how the world works, ISIS, Khmer Rouge, Mao, Narcissism, Pol Pot, psychology of power, psychopath, Stalin, tyranny by Ian | disorderedworld. Bookmark the permalink.